David Bunch the Assistant Presiding Bishop Of The Jesus Christ Apostolic Ministries International, was Born September 26, 1948 in Baton Rouge, LA. Felt the call of God on his life while walking through some pine trees at age 6. 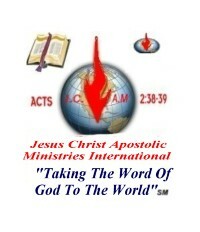 Received the Gift of the Holy Ghost and was baptized in Jesus Name in April of 1973. District and Assistant Presiding Bishop of JCAMI. His current burden is to start a new church in the Baton Rouge area. Also has a burden to start an international work on the LSU campus. to be born December 28, 2007 - Elayna Noelle Bunch. Farrah's niece, Kristen Shirey, came to live with them at the age of 10. She is very active in the youth group and is going to Ireland with them.